Kooboo is a CMS based on ASP.NET MVC. Recently, I got a chance to take it for a spin, and here are some of my thoughts. Keep in mind that the drawbacks here may come just from my ignorance of the tool use. :) I’ll update this as the more I learn about the inner workings. Manage website resources easily – images/documents/etc. May not be a drawback once I figure out the “how” and get better understanding. Once a site is created, when I migrated from XML to MongoDB, I lost all the website data from the XML files. Admin Panel’s UI may not be intuitive to non-designers/programmers. 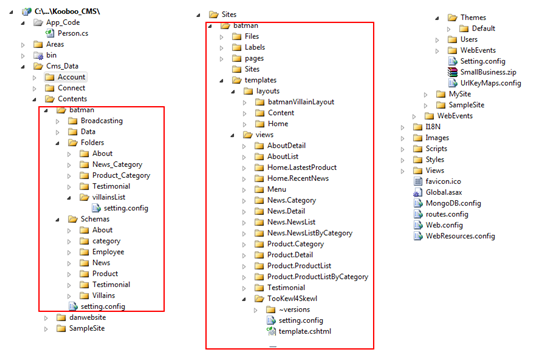 Site directory structure Kooboo generates is not the same as the traditional ASP.NET MVC. When a content type is created, it does not create a C# class file. (I didn’t see one at least, in the directory structure.) It does, however, create a MongoDB collection for the content, there’s just no C# class mapped to it. There’s no clear way to bind a View to a model class as in traditional ASP.NET MVC since, Kooboo doesn’t create a C# class file. It doesn’t follow the traditional file/folder naming convention: for each View, you map that to a model. Community not as large as other CMS communities (Orchard, Umbraco, DNN). I’ll keep exploring, but this is what I’ve found so far.